Based on centuries of traditional medicine, this plant can rebalance blood levels and promote a healthy state of being. 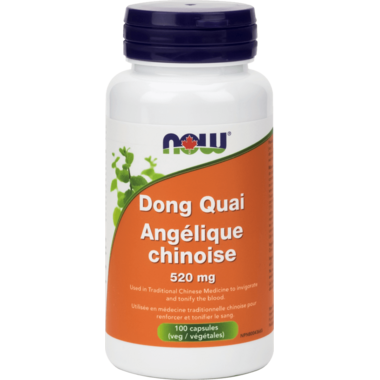 Dong Quai (Angelica sinensis) Root has been highly valued for thousands of years by Asian herbalists for its effects on blood quality. Dong Quai is widely known as a tonifying plant for females. 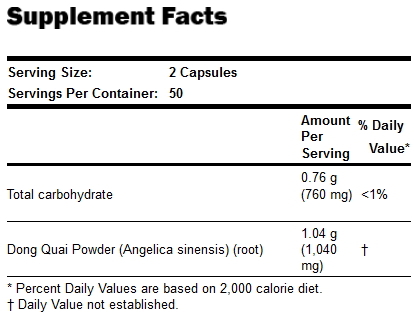 Suggested Usage: As a dietary supplement, take 2 capsules 3 times daily, preferably with meals. Contains No: Sugar, salt, starch, yeast, wheat, gluten, corn, soy, milk. I have used this product for many months. I started using it to correct what I believed to be a hormone imbalance because of my symptoms. My PMS and other symptoms were significantly reduced. This product arrived as described and appears not to have any harmful side effects. I've been taking it for two weeks, so I am still waiting on long term results.